The Swaziland Government was forced into a humiliating climb down at the High Court when it could not provide evidence that the chief government vehicle inspector Bhantshana Gwebu should be held in prison pending trial on a contempt of court charge because he was a trade union member and therefore might run away to evade trail. Gwebu had been sent to prison for seven days on remand by the Swazi Chief Justice Michael Ramodibedi for contempt of court. He was accused of unlawfully detained High Court Judge Esther Ota, who was being chauffeured in an ‘authorised’ government vehicle, near Sifundzani. Gwebu believed the judge was not on official business and therefore should not have been using a government car. The Government opposed bail at a hearing at the High Court on Wednesday (29 January 2014). The Director of Public Prosecutions (DPP) wanted Gwebu held in prison until his trial date because he was a member of the trade union, the National Public Service and Allied Workers Union (NAPSAWU). The DPP claimed to the court that NAPSAWU had ‘politicised’ the case and the union would help Gwebu to evade trial. It also submitted that if released on bail Gwebu might ‘disturb the public order or undermine public peace and security’. But, when High Court Judge Bheki Maphalala asked the prosecution to supply evidence and clarify how the case had been politicised and how NAPSAWU could assist Gwebu to evade trial, it could not. It then formally withdrew the allegations. Local media reported Judge Maphalala saying it was the duty of the court to dispense justice to all without fear or favour. He said the Crown submitted that Gwebu was a flight risk because he was in association with a union, NAPSAWU. The judge noted that Gwebu surrendered to the police after a warrant of his arrest had been issued. ‘It is also common cause that the union in question is legally recognized in the country,’ he said. Advocate Norman Kades for the DPP withdrew the allegation and Judge Maphalala released Gwebu on E15,000 (US$1,500) bail. Gwebu had been in prison for nine days awaiting the bail hearing, which had been delayed because the DPP claimed it was not ready to proceed with the case. The DPP was forced into a second climb down when the prosecution claimed that the papers for the Crown were drafted hastily as they did not have sufficient time. Judge Maphalala, however, informed him that this was not true as they had six days to prepare their papers. The case involving Gwebu has received international attention because of the way he was charged with contempt of court by the Swazi Chief Justice Michael Ramodibedi. Gwebu had been refused legal representation. Gwebu, in his role as chief government vehicle inspector, had charged and arrested, Vusi Tsela, for driving a government vehicle without authority. Tsela is the official driver for High Court judge, Esther Ota, and, it was reported that he had taken her to one of the elite schools in Mbabane on a Saturday so that she could buy her children’s uniforms before classes resumed. Gwebu’s case is that Tsela did not have the right papers to allow him to drive the car for that trip, so Gwebu subsequently charged him and impounded the car. Ota said that she was on her way to court because she was the duty judge for the weekend and had just needed to run some personal errands before going to work. It has also been reported that Gwebu once impounded Chief Justice Ramodibedi’s official car after he allegedly abused it. Observers say Ramodibedi’s actions in charging Gwebu for contempt of court this time might be ‘pay-back’ for that. The Swaziland Government has wasted more than US$100 million that was meant to help poor people in rural areas, a new auditor-general’s report has revealed. The money was supposed to be used for projects to alleviate poverty under the Rural Development Fund (RDF), which is administered by the Swazi Ministry for Tinkhundla. Instead, the money was squandered on useless goods that were left idle and unused. Media in Swaziland reported that an Auditor-General’s report said as a result more than E1 billion (US$100 million) has been wasted since the RDF was set up in 1999. Muziwandile Dlamini from the office of the Auditor-General revealed that some constituencies made orders for items that ended up not being utilised. Dlamini said audits conducted in some constituencies had revealed the problem and now more constituencies would be audited. The Swazi Observer newspaper reported Dlamini saying in some cases, items were ordered and not delivered while in other times the wrong items were delivered and then ended up not being utilised by the constituencies. Dlamini said this was a clear indication that some constituencies initiated projects that were not required, but they did so just for the sake of doing something. Dlamini added failure to coordinate and plan for their projects was often the cause for collapse of the projects initiated by tinkhundla. Tinkhundla is the political system used in Swaziland that bans all political parties from contesting elections and places power in the hands of King Mswati III, who rules as sub-Saharan Africa’s last absolute monarch. Seven in ten of the King’s 1.3 million subjects live in abject poverty, earning less than US$2 per day. The King is reported have a personal fortune estimated at US$200 million. He has 13 palaces, one for each of his wives, a private jet airplane and fleets of Mercedes Benz and BMW cars. Five homes and a school will have to be destroyed to make way for the expansion of one of King Mswati III’s 13 palaces. King Mswati, who rules Swaziland as sub-Saharan Africa’s last absolute monarch, is extending his Lozitha Palace, near the Swazi capital Mbabane. Electricity lines are also being moved because they will now fall within the boundary of the King’s palace. One of the homes to be moved houses a 92-year-old man. All the properties affected are on Swazi Nation Land. King Mswati holds all Swazi Nation Land ‘in trust’ for the Swazi people. The Times of Swaziland, the only daily newspaper independent of the King’s direct control, reported that the King’s Office is presently erecting a ‘concrete boundary’ to the palace. It described the new building as a ‘Royal fort’. It reported Sihle Dlamini, Estate Manager of the King’s Office, saying the expansion of the palace had been sanctioned by King Mswati. He said the affected families would be relocated, but he could not say where to. King Mswati, who rules over a population of 1.3 million subjects, has 13 palaces, one for each of his wives. Meanwhile, seven in ten of his subjects live in abject poverty earning less than US$2 per day. The King, who was once estimated by Forbes Magazine to have a private fortune of US$200 million, has a private jet airplane and fleets of Mercedes and BMW cars. He and his wives regularly take luxury trips abroad. In March 2013 it was reported that Swaziland taxpayers were being forced to spend E2.2 million (US$240,000) on a guardhouse at Lozitha Palace to house more than eight soldiers around the clock and it will connect to an underground bunker. Principal Secretary in the Ministry of National Defence and Security, Andrias Mathabela, refused to disclose the purpose of the bunker. SSN said a total of E256 million (US$37 million) was used each year as ‘royal emoluments’ and was, ‘shared between his wives, children, his half-brother and their mothers, and other relatives of the royal family’. Swaziland’s Chief Justice Michael Ramodibedi has attacked the kingdom’s only independent daily newspaper and forced it to apologise ‘unreservedly’ after it published criticisms of his handling of a contempt of court case. But, although the Times of Swaziland has been gagged, international observers continue to criticise Ramodibedi for his actions. One article published by the Open Society Initiative for Southern Africa (OSISA ) called the case, ‘the end of the road for the rule of law in Swaziland’, the kingdom ruled by King Mswati III, sub-Saharan Africa’s last absolute monarch. The contempt of court case involves Bhantshana Gwebu, the Swazi Government’s chief vehicle inspector. Phakathi added, ‘On Saturday January 18th, Gwebu - in his role as chief government vehicle inspector - charged and arrested, Vusi Tsela, for driving a government vehicle without authority. Now, Tsela happens to be the official driver for High Court judge, Esther Ota, and he had taken her to one of the elite schools in Mbabane so that she could buy her children's uniforms before classes resumed on January 21st. ‘When Gwebu pounced and demanded to see the official documents that allowed Tsela to drive the car to this school on a Saturday, he discovered that Tsela did not have the right papers. He subsequently charged him and impounded the car, while Ota pleaded that she was on her way to court because she was the duty judge for the weekend and had just needed to run some personal errands before going to work. Gwebu was rapidly issued with a warrant of arrest and handed himself in to police on Monday January 20. Phakathi added, ‘Meanwhile, Ramodibedi himself is facing impeachment charges in his home country, Lesotho, where he was suspended from his position as Court of Appeal president. So it sadly comes as no surprise that Ramodibedi has bypassed the law in this latest case. Despite his position as the head of the judiciary, the law seems to be something that he can take or leave - depending on who is involved. Clearly, he believes that there is a group of powerful, influential people - not just the King and his mother - who are above the law of the land. When the Times of Swaziland ran a version of the story on its website, it attracted a number of critical comments from readers. Ramodibedi then demanded his apology from the newspaper, which is the only daily newspaper in the kingdom free of direct monarchical control. Journalists who criticise the judiciary are not tolerated by the judges in Swaziland. In April 2013 Bheki Makhubu the editor of the monthly magazine the Nation was convicted of criminal contempt of court after publishing two articles criticising the judiciary. He was fined E200,000 (US$22,000) by the High Court and told if he did not pay within three days he would immediately go to jail for two years. His sentence is on hold pending an appeal to the Swaziland Supreme Court. Journalists in Swaziland were blocked from taking photographs of the human rights abuser, Equatorial Guinea President Teodoro Obiang Nguema Mbasogo, when he arrived to visit King Mswati III, sub-Saharan Africa’s last absolute monarch. The president arrived in the kingdom this week with a delegation of more than 50 people, including investors who were looking for business opportunities. The Swazi Observer, a newspaper in effect owned by King Mswati, reported, ‘The media was initially turned back from the airport as it was stated that orders were that no pictures be captured of the president’s visit to Swaziland. ‘A protocol officer only referred to as Shongwe approached journalists who were taking pictures of those present at the airport and informed them to stop at once. ‘“I have been instructed to tell you that you aren’t allowed to take pictures of this private visit so please delete what you have,” Shongwe warned. King Mswati has a close relationship with the President of Equatorial Guinea. It was reported in January 2012 that the King had done a deal with the President to import crude oil into his kingdom. Thembinkosi Mamba, Principal Secretary in the Ministry of Natural Resources and Energy, said at the time the Swazi Government had plans to build its own refinery so that, in future, crude oil would be brought directly to Swaziland for refinement and separation, thereby, cutting down on costs. Swazi Media Commentary reported at the time that the deal looked to be something special the King had dreamt up. In the past, as with the US$5 billion power plant deal that turned out to be a con-trick, the King had bypassed his parliament and made deals on his own initiative. At the time of the oil refinery deal, Obiang’s regime had been labelled one of the world’s most corrupt by international rights groups. Transparency International ranked Equatorial Guinea 168th out of 178 countries for its efforts in tackling corruption. Human rights abuses in Equatorial Guinea are well documented. The US State Department, in a report on Equatorial Guinea published in May 2012, revealed, corruption and impunity continued to be big human rights problems in Equatorial Guinea. In 2012, newspapers in Swaziland suppressed news about Mbasogo during his visit to Swaziland when instructed to do so by a Swazi Government minister. The Media Institute of Southern Africa (MISA) Swaziland Chapter reported in its annual review on media freedom, ‘In January 2012, Minister of Information, Communication and Technology (ICT), Winnie Magagula held an impromptu meeting with all [print] editors , where she told them they must positively report the visit of Equatorial Guinean President, Teodora Obiang Nguema Mbasago. It could take a passenger landing on an aircraft at Swaziland’s new Sikhuphe International Airport nearly two hours to get through the terminal, official figures from the Swaziland Civil Aviation Authority (SWACAA ) suggest. 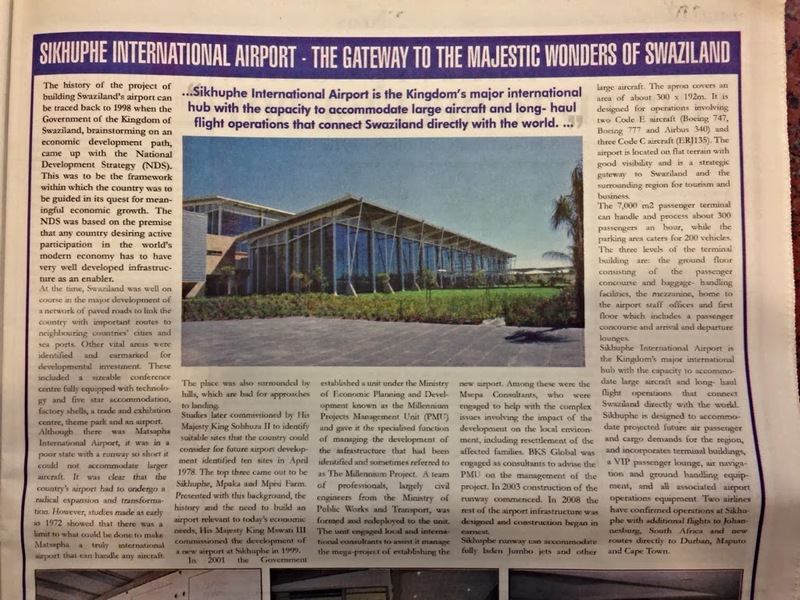 A SWACCA advertisement appearing in the Times of Swaziland on Tuesday (22 January 2014) said that Sikhuphe would be able to accommodate ‘fully laden Jumbo Jets and other large aircraft’. Among the aircraft listed were the Boeing 747, the Boeing 777 and the Airbus 340. What it did not say was that aircraft such as the Boeing 747 and 777 could have at least 400 and more than 550 passengers when fully loaded. This means it could take at least two hours to load and offload passengers on a single flight. If two aircraft landed in a single hour it would be nearly impossible to deal with the passenger numbers. The figures add further weight to criticism that Sikhuphe International Airport, which is costing an estimated E3 billion (US$300 million) to build in a wilderness about 80km from the Swazi capital, Mbabane, is not viable. No international airline has announced it has agreed to use Sikhuphe, however, the advertisement said, ‘Two airlines have confirmed operations at Sikhuphe.’ It did not name them, but did say there would be flights to Johannesburg, Durban and Cape Town in South Africa and to Maputo in Mozambique. Sikhuphe has been under construction for at least 10 years. The date for the airport’s opening in 2010 was missed and has been put back a number of times since. In November 2013, SWACAA said the airport was now completed and operational, but no flights have been in or out since. This month, Prince Hlangusemphi, Minister of Economic Planning and Development admitted that no taxiway had been built to allow aircraft to move around the airport after landing. He said the taxiway would be completed ‘very soon’. Then, he said, the airport could be officially opened by King Mswati III. As recently as October 2013 a report from the International Air Transport Association (IATA) said Sikhuphe International Airport was widely perceived as a ‘vanity project’ because of its scale and opulence compared with the size and nature of the market it seeks to serve. No independent study on the need for Sikhuphe Airport was ever undertaken and the main impetus behind its construction has been King Mswati, who rules Swaziland as sub-Saharan Africa’s last absolute monarch. He believes the airport will lend credibility to his dream to make Swaziland a ‘First World’ nation by 2022. In 2003, the International Monetary Fund said Sikhuphe should not be built because it would divert funds away from much needed projects to fight poverty in Swaziland. About seven in ten of King Mswati’s 1.3 million subjects live in abject poverty, earning less than US$2 per day. It is increasingly difficult to believe a word the Swaziland Government says about the kingdom’s Sikhuphe International Airport. The airport is being built in a wilderness about 80 km from the Swazi capital, Mbabane. In November 2013, it was announced that it was completed and ready to open as soon as King Mswati III gave the word. However, it has been known for at nearly three years that the airport had no taxiway. In February 2011, Swazi Media Commentary revealed this and reported that without a taxiway the airport would not be able to handle large numbers of planes taking off and landing, thereby severely limiting the number of passengers and amount of cargo the airport could handle if it ever opened. To handle large numbers of passengers, the airport needs to be able to get planes to fly off quickly and land quickly. Once one plane is safely on the ground after landing it drives out of the way on the taxiway to allow another plane to land or take off on the runway it has just vacated. But, with no taxiway, once a plane has landed it will have to back up along the runway to take passengers to the terminal, thereby blocking the runway for any other plane wanting to land or take off. The Times in its report quoted Prince Hlangusemphi, Minister of Economic Planning and Development saying the taxiway was not on the original plan for the airport. He said the taxiway would be completed ‘very soon’. Then, he said, the airport could be officially opened by King Mswati. When that date will be has not been announced. Sikhuphe has been under construction for at least 10 years. The date for the airport’s opening in 2010 was missed and has been put back a number of times since. In November 2013, the Swaziland Civil Aviation Authority (SWACAA) said the airport was now completed and operational, but no flights have been in or out since. The Sikhuphe project has been the subject of much misinformation from the King, the government he hand picks, and civil aviation officials in Swaziland. They regularly announce new deadlines for completion and opening of the airport, but these dates come and go and Sikhuphe remains unfinished. No explanations for the missed deadlines are usually given. When they are they often relate to claims that ‘bad weather’ hampered construction work. Despite claims over the past years that international airlines are keen to fly into Sikhuphe, no agreements have been signed. In November 2013, SWACAA confirmed that the Swazi Government was ready to recreate the defunct Royal Swazi National Airways Corporation (RSNAC0 and would set about purchasing a 100-seater jet, at a cost estimated by the Times of Swaziland of E700 million (US$70 million). This compares to the E125 million budgeted for free primary school education in Swaziland this year. It is not clear where the money to buy the aircraft would come from. SWACAA said RSNAC would fly to 10 destinations in Africa and Asia. Observers estimated RSNAC would probably need a minimum of 10 aircraft to service the routes. For that to happen, Swaziland would have to spend about E7 billion on aircraft. Such a sum of money would bankrupt the kingdom. To put the cost in context the Central Bank of Swaziland has estimated the kingdom’s gross official reserves were E8.24 billion at the month ended November 2013. Media reports in Swaziland suggest the cost of Sikhuphe has been about E3 billion so far from an initial budget of E500 million. Critics of Sikhuphe have argued for years that there is no potential for the airport. Major airports already exist less than an hour’s flying time away in South Africa with connecting routes to Swaziland and there is no reason to suspect passengers would want to use the airport at Sikhuphe as an alternative. Swaziland’s present airport at Matsapha, situated near a main road between Swaziland’s capital city Mbabane and the kingdom’s commercial centre, Manzini, only carries about 70,000 passengers a year. King Mswati III of Swaziland has given game rangers permission to shoot-to-kill people suspected of poaching wildlife on the monarch’s land and protects them from prosecution for murder in some circumstances. He has had this for at least ten years. In 2004 Reilly appeared in a documentary produced by Journeyman Pictures in which he spoke of his relationship to the King and showed his warrant on camera. In a post on its own website as recently as 30 October 2013, BGP said, ‘a zero tolerance towards poaching must be exercised’. This news comes as an impoverished unarmed local man, Thembinkosi Ngcamphalala, aged 21, died of gunshot wounds last Sunday (12 January 2014). He had been shot by a ranger outside of the Mkhaya Nature Reserve. His family, who live at Sigcaweni just outside the reserve’s borders, said he had not been poaching. BGP owns and manages Mlilwane Wildlife Sanctuary and Mkhaya Nature Reserve. It also manages Hlane National Park, the kingdom’s largest protected area, held in trust for the Nation by the King, who rules Swaziland as sub-Saharan Africa’s last absolute monarch. Swaziland has a long history of killings by rangers of local people. Campaigners say poor people are not poaching large game, such as the endangered black rhinos, but go hunting animals, such as warthogs, as food to feed themselves and their families. Hunger and malnutrition are widespread in Swaziland where seven in ten of King Mswati’s subjects live in abject poverty. Many are forced to become hunters and gatherers to avoid starvation. International attention has focussed on the many human rights violations committed against local people who live close to the King’s game reserves. A report on human rights in Swaziland published by the US State Department said that on July 10 2010, in Mlawula ‘rangers shot and killed Lucky Matsenjwa, who was suspected of poaching. Matsenjwa reportedly was unarmed’. In 2008, a young Swazi man, Musa Gamedze, was hunted down and executed in broad daylight at his home, in full view of his children. The campaign group Friends of the Earth reported at the time that eyewitnesses said the man who fired the fatal shot was a manager at a local private game reserve. The manager was accompanied by three police officers. Musa Gamedze was part of a community that was forcibly evicted, without compensation, by BGP from land they had lived on for more than four decades. Friends of the Earth is also campaigning against the Game Act 1991 which allows game rangers, ‘to arrest without a warrant any person suspected upon reasonable grounds’ to have been poaching on a reserve. The rangers can make arrests up to one mile from the boundary of the game reserve. Ted Reilly, the chief executive of BGP, was described by Inter Press Services as, ‘One of the architects of the Game Act’. In its 2012 report on human rights in Swaziland, Amnesty International said a Swazi parliamentary committee had investigated alleged brutality by game rangers against suspected poachers. Its conclusions and recommendations to parliament listed nine incidents of deaths and injuries against game rangers and 33 against suspected poachers. ‘Some suspected poachers injured by game rangers were then prosecuted under the Game Act (as amended). No game rangers were prosecuted for fatal or non-fatal shootings. The committee recommended urgent reform of clauses in the Game Act (as amended), which could be interpreted to “condone brutality towards suspect poachers”,’ Amnesty reported. There are numerous incidents involving rangers shooting local people. One reported by international media in 2011concerned a 16-year-old boy who was shot in the back by a ranger. The teenager, who as a minor cannot be named, told the AFP news agency he and two friends were walking outside the perimeter of the southern Mkhaya Reserve when rangers gave chase. He said they shot him in the back. ‘I am angry. If only they could have warned us first maybe I would have understood,’ he told AFP. BGP spokesman Mike Richardson told AFP the shooting occurred after dark inside the park. Rangers could not be certain if the boys were armed. AFP reported at the time, BGP has a close relationship to Swazi Royalty that goes back to the 1960s. ‘The parks provide the royal clan with a steady supply of animal pelts for the many traditional ceremonies that mark the Swazi calendar. ‘King Mswati III has entrusted the company to enforce Swaziland’s anti-poaching law to protect “royal game”,’ AFP reported. In April 2010, Swazi lawyer Thuli Makama won a prestigious environmental award, the Goldman Environmental Prize, for her work exposing the extra-judicial killings of suspected poachers by game rangers. Makama, head of the Swazi environmental group Yonge Nawe, told the BBC at the time the problem of rangers ‘overstepping’ their powers occurred mostly in private game reserves. Makama said while researching a documentary about local communities, she discovered at least 20 cases of suspected poachers who had been killed or maimed.